American test pilot astronaut 1963-1981. Fourth person to walk on the moon. Status: Inactive; Active 1963-1981. Born: 1932-03-15. Died: 2018-05-26. Spaceflights: 2 . Total time in space: 69.66 days. Birth Place: Wheeler, Texas. PERSONAL DATA: Born in Wheeler, Texas, on March 15, 1932. Married. Two grown children, a son and a daughter. EDUCATION: Graduated from Paschal High School in Fort Worth, Texas; received a bachelor of science degree in aeronautical engineering from the University of Texas in 1955; awarded an honorary doctorate of science from Texas Wesleyan College in 1972; presented an honorary doctorate of engineering science degree from the University of Akron (Ohio) in 1974. ORGANIZATIONS: Fellow of the American Astronautical Society; member of the Society of Experimental Test Pilots. SPECIAL HONORS: Helped establish 11 world records in space and astronautics; awarded two NASA distinguished Service Medals, the Navy Astronaut Wings and two Navy Distinguished Service Medals; recipient of the Rear Admiral William S. Parsons Award for Scientific and Technical Progress, the University of Texas Distinguished Alumnus Award and Distinguished Engineering Graduate Award, the Godfrey L. Cabot Award, the National Academy of Television Arts and Sciences Trustees Award, the Texas Press Associations Man of the Year Award for 1969, the City of Chicago Gold Medal, the Robert J. Collier Trophy for 1973, the Federation Aeronautique Internationales Yuri Gagarin Gold Medal for 1973 and the V.M. Komarov Diploma for 1973 (1974), the Dr. Robert H. Goddard Memorial Trophy for 1975 (1975), the AIAA Octave Chanute Award for 1975 (1975), the AAS Flight Achievement Award for 1974 (1975). 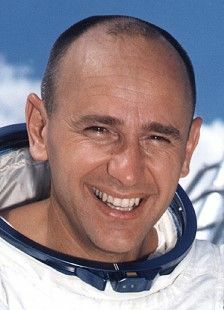 EXPERIENCE: Alan Bean, a Navy ROTC Student at Texas, was commissioned upon graduation in 1955. After completing flight training, he was assigned to a jet attack squadron in Jacksonville, Florida. After a four-year tour of duty, he attended the Navy Test Pilot School, then flew as a test pilot on several types of naval aircraft. NASA EXPERIENCE: Alan Bean was one of the third group of astronauts named by NASA in October 1963. He served as backup astronaut for the Gemini 10 and Apollo 9 missions. Captain Bean was lunar module pilot on Apollo 12, mans second lunar landing. In November 1969, Captain Bean and Captain Pete Conrad landed in the moons Ocean of Stormsafter a flight of some 250,000 miles. They explored the lunar surface, deployed several lunar surface experiments, and installed the first nuclear power generator station on the moon to provide the power source. Captain Richard Gordon remained in lunar orbit photographing landing sites for future missions. Captain Bean was spacecraft commander of Skylab Mission II (SL-3), July 29 to September 25, 1973. With him on the 59-day, 24,400,000 mile world record setting flight were scientist-astronaut Dr. Owen K. Garriott and Marine Corps Lieutenant Colonel Jack R. Lousma. Mission II accomplished 150% of its pre-mission forecast goals. On his next assignment, Captain Bean was backup spacecraft commander of the United States flight crew for the joint American-Russian Apollo-Soyuz Test Project. Captain Bean has logged 1,671 hours and 45 minutes in spaceof which 10 hours and 26 minutes were spent in EVAs on the moon and in earth orbit. Captain Bean has flown 27 types of military aircraft as well as many civilian airplanes. He has logged more than 7,145 hours flying timeincluding 4,890 hours in jet aircraft. Captain Bean retired from the Navy in October 1975 but continued as head of the Astronaut Candidate Operations and Training Group within the Astronaut Office in a civilian capacity. Bean resigned from NASA in June 1981 to devote his full time to painting. He said his decision was based on the fact that, in his 18 years as an astronaut, he was fortunate enough to visit worlds and see sights no artists eye, past or present, has ever viewed firsthand and he hopes to express these experiences through the medium of art. He is pursuing this dream at his home and studio in Houston. This is the only version available from NASA. Updates must be sought from the above named individual. BIRTHPLACE AND DATE: Bean was born March 15, 1932, in Wheeler, Texas. EDUCATION: Bean received a Bachelor of Science degree in aeronautical engineering from the University of Texas in 1955. EXPERIENCE: As a Navy ROTC student, Bean was commissioned after graduation from college. After completing flight training, he was assigned to a jet attack squadron at the Naval Air Station in Jacksonville, Florida. After a four-year tour, he attended the Navy Test Pilot School and thereafter flew several types of new Navy aircraft as a test pilot. Bean was selected by NASA in the third group of astronauts in October 1963. He served on the backup crews of Gemini 10 and Apollo 9 missions before assignment as Lunar Module pilot for Apollo 12. On November 19, 1969, Commander Pete Conrad and Bean landed on the Ocean of Storms and became the third and fourth humans to walk on the moon, while Richard Gordon orbited overhead in the Command Module. During two outside excursions they deployed several surface experiments, powered by the first nuclear thermal generator deployed on the moon. Their pinpoint landing allowed them to inspect an unmanned Surveyor spacecraft that landed there two years earlier. They collected and returned 30 kg of rocks and lunar soil for study on Earth. Bean commanded the second manned Skylab mission, Skylab 3, launched on July 28, 1973. 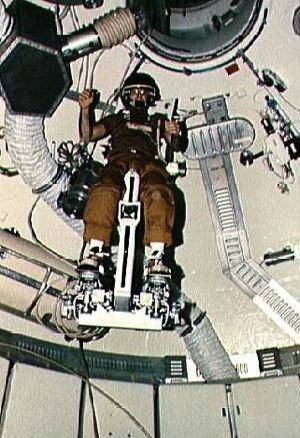 The other crew members were Science Pilot Owen Garriott and Command Module pilot Jack Lousma. They would spend 59 days aboard the space workshop. On the third EVA of the mission, Bean and Garriott installed a new set of gyroscopes to replace failed units. During the course of the mission Earth resources photography, solar astronomy, metals processing and biological experiments were conducted. Bean retired from the Navy in 1975 but continued with NASA as head of the Astronaut Candidate Operations and Training Group. He retired from NASA in 1981 and thereafter became a space painter of some repute. Family: Astronaut. Country: USA. Spacecraft: Gemini, Skylab. Flights: Gemini 10, Apollo 9, Apollo 12, Skylab 3, Apollo (ASTP). Projects: Apollo, ASTP. Agency: USN. Bibliography: 5152. 1932 March 15 - . Birth of Alan LaVerne 'Al' Bean - . Nation: USA. Related Persons: Bean. American test pilot astronaut 1963-1981. Fourth person to walk on the moon. 2 spaceflights, 69.7 days in space. Flew to orbit on Apollo 12 (1969), Skylab 3..
1966 July 18 - . 22:20 GMT - . Launch Site: Cape Canaveral. Launch Complex: Cape Canaveral LC19. LV Family: Titan. Launch Vehicle: Titan II GLV. Gemini 10 - . Call Sign: Gemini 10. Crew: Collins, Young. Backup Crew: Bean, Williams, Clifton. Payload: Gemini SC10. Mass: 3,763 kg (8,295 lb). Nation: USA. Agency: NASA Houston. Class: Manned. Type: Manned spacecraft. Flight: Gemini 10. Spacecraft: Gemini. Duration: 2.95 days. Decay Date: 1966-07-21 . USAF Sat Cat: 2349 . COSPAR: 1966-066A. Apogee: 259 km (160 mi). Perigee: 160 km (90 mi). Inclination: 28.90 deg. Period: 88.70 min. An Air Force Titan Gemini Launch Vehicle placed the Gemini 10 (GT-10) spacecraft into orbit for the three-day mission of Astronauts John Young and Michael Collins. Rendezvous and docking were accomplished with the Gemini Agena Target Vehicle (GATV) that had been launched from Cape Kennedy aboard an Atlas Booster just ahead of GT-10. Using the GATV-10 Primary Propulsion System (PPS), the docked vehicles achieved a manned-flight altitude record of 476 miles. Reentry was accomplished on 21 July and recovery was made 544 miles east of Cape Canaveral. Exciting mission with successful docking with Agena, flight up to parking orbit where Gemini 8 Agena is stored. Collins space walks from Gemini to Agena to retrieve micrometeorite package left in space all those months. Loses grip first time, and tumbles head over heels at end of umbilical around Gemini. Package retrieved on second try. The Gemini X mission began with the launch of the Gemini Atlas-Agena target vehicle from complex 14. The Gemini Agena target vehicle (GATV) attained a near-circular, 162- by 157-nautical-mile orbit. Spacecraft No. 10 was inserted into a 145- by 86-nautical-mile elliptical orbit. Slant range between the two vehicles was very close to the nominal 1000 miles. Major objective of the mission was achieved during the fourth revolution when the spacecraft rendezvoused with the GATV at 5 hours 23 minutes ground elapsed time and docked with it about 30 minutes later. More spacecraft propellant was used to achieve rendezvous than had been predicted, imposing constraints on the remainder of the mission and requiring the development of an alternate flight plan. As a result, several experiments were not completed, and another secondary objective - docking practice - was not attempted. To conserve fuel and permit remaining objectives to be met, the spacecraft remained docked with the GATV for about 39 hours. During this period, a bending mode test was conducted to determine the dynamics of the docked vehicles, standup extravehicular activties (EVA) were conducted, and several experiments were performed. The GATV primary and secondary propulsion systems were used for six maneuvers to put the docked spacecraft into position for rendezvous with the Gemini VIII GATV as a passive target. The spacecraft undocked at 44 hours 40 minutes ground elapsed time, separated from the GATV, and used its own thrusters to complete the second rendezvous some three hours later. At 48 hours and 42 minutes into the flight, a 39-minute period of umbilical EVA began, which included the retrieval of a micrometorite collection package from the Gemini VIII Agena. The hatch was opened a third time about an hour later to jettison extraneous equipment before reentry. After about three hours of stationkeeping, the spacecraft separated from the GATV. At 51 hours 39 minutes ground elapsed time, the crew performed a true anomaly-adjust maneuver to minimize reentry dispersions resulting from the retrofire maneuver. 1969 March 3 - . 16:00 GMT - . Launch Site: Cape Canaveral. Launch Complex: Cape Canaveral LC39A. Launch Platform: LUT2. Launch Vehicle: Saturn V.
Apollo 9 - . Call Sign: Gumdrop. Crew: McDivitt, Schweickart, Scott. Backup Crew: Bean, Conrad, Gordon. Payload: Apollo CSM 104 / Apollo LM 3 / Saturn S-IVB-504N. Mass: 36,511 kg (80,492 lb). Nation: USA. Agency: NASA Houston. Program: Apollo. Class: Moon. Type: Manned lunar spacecraft. Flight: Apollo 9. Spacecraft: Apollo CSM. Duration: 10.04 days. Decay Date: 1969-03-13 . USAF Sat Cat: 3769 . COSPAR: 1969-018A. Apogee: 187 km (116 mi). Perigee: 185 km (114 mi). Inclination: 32.60 deg. Period: 88.60 min. Apollo 9 (AS-504), the first manned flight with the lunar module (LM-3), was launched from Pad A, Launch Complex 39, KSC, on a Saturn V launch vehicle at 11:00 a.m. EST March 3. Originally scheduled for a February 28 liftoff, the launch had been delayed to allow crew members James A. McDivitt, David R. Scott, and Russell L. Schweickart to recover from a mild virus respiratory illness. Following a normal launch phase, the S-IVB stage inserted the spacecraft into an orbit of 192.3 by 189.3 kilometers. After post-insertion checkout, CSM 104 separated from the S-IVB, was transposed, and docked with the LM. At 3:08 p.m. EST, the docked spacecraft were separated from the S-IVB, which was then placed on an earth-escape trajectory. On March 4 the crew tracked landmarks, conducted pitch and roll yaw maneuvers, and increased the apogee by service propulsion system burns. On March 5 McDivitt and Schweickart entered the LM through the docking tunnel, evaluated the LM systems, transmitted the first of two series of telecasts, and fired the LM descent propulsion system. They then returned to the CM. McDivitt and Schweickart reentered the LM on March 6. After transmitting a second telecast, Schweickart performed a 37-minute extravehicular activity (EVA), walking between the LM and CSM hatches, maneuvering on handrails, taking photographs, and describing rain squalls over KSC. On March 7, with McDivitt and Schweickart once more in the LM, Scott separated the CSM from the LM and fired the reaction control system thrusters to obtain a distance of 5.5 kilometers between the two spacecraft. McDivitt and Schweickart then performed a lunar-module active rendezvous. The LM successfully docked with the CSM after being up to 183.5 kilometers away from it during the six-and-one-half-hour separation. After McDivitt and Schweickart returned to the CSM, the LM ascent stage was jettisoned. During the remainder of the mission, the crew tracked Pegasus III , NASA's meteoroid detection satellite that had been launched July 30, 1965; took multispectral photos of the earth; exercised the spacecraft systems; and prepared for reentry. 1973 July 28 - . 11:10 GMT - . Launch Site: Cape Canaveral. Launch Complex: Cape Canaveral LC39B. Launch Platform: LUT1. LV Family: Saturn I. Launch Vehicle: Saturn IB. Skylab 3 - . Call Sign: Skylab. Crew: Bean, Garriott, Lousma. Backup Crew: Brand, Lenoir, Lind. Payload: Apollo CSM 117. Mass: 20,121 kg (44,359 lb). Nation: USA. Agency: NASA Houston. Program: Skylab. Class: Moon. Type: Manned lunar spacecraft. Flight: Skylab 3. Spacecraft: Apollo CSM. Duration: 59.46 days. Decay Date: 1973-09-25 . USAF Sat Cat: 6757 . COSPAR: 1973-050A. Apogee: 442 km (274 mi). Perigee: 422 km (262 mi). Inclination: 50.00 deg. Period: 93.20 min. Continued maintenance of the Skylab space station and extensive scientific and medical experiments. Installed twinpole solar shield on EVA; performed major inflight maintenance; doubled record for length of time in space. Completed 858 Earth orbits and 1,081 hours of solar and Earth experiments; three EVAs totalled 13 hours, 43 minutes. The space vehicle, consisting of a modified Apollo command and service module payload on a Saturn IB launch vehicle, was inserted into a 231.3 by 154.7 km orbit. Rendezvous maneuvers were performed during the first five orbits as planned. During the rendezvous, the CSM reaction control system forward firing engine oxidizer valve leaked. The quad was isolated. Station-keeping with the Saturn Workshop began approximately 8 hours after liftoff, with docking being performed about 30 minutes later. 1973 September 22 - . 11:18 GMT - . EVA Skylab 3-3 - . Crew: Bean, Garriott. EVA Duration: 0.11 days. Nation: USA. Related Persons: Bean, Garriott. Program: Skylab. Class: Manned. Type: Manned space station. Flight: Skylab 3. Spacecraft: Skylab. Replaced film cartridges for solar camera..
1973 September 25 - . 22:19 GMT - . Landing of Skylab 3 - . Return Crew: Bean, Garriott, Lousma. Nation: USA. Related Persons: Bean, Garriott, Lousma. Program: Skylab. Flight: Skylab 3. Skylab 3 landed at 22:19 GMT..
1975 July 15 - . 19:50 GMT - . Launch Site: Cape Canaveral. Launch Complex: Cape Canaveral LC39B. Launch Platform: LUT1. LV Family: Saturn I. Launch Vehicle: Saturn IB. Apollo (ASTP) - . Call Sign: Apollo. Crew: Brand, Slayton, Stafford. Backup Crew: Bean, Evans, Lousma. Payload: Apollo CSM 111. Mass: 14,768 kg (32,557 lb). Nation: USA. Agency: NASA Houston. Program: ASTP. Class: Moon. Type: Manned lunar spacecraft. Flight: Apollo (ASTP), Soyuz 19 (ASTP). Spacecraft: Apollo CSM. Duration: 9.06 days. Decay Date: 1975-07-24 . USAF Sat Cat: 8032 . COSPAR: 1975-066A. Apogee: 166 km (103 mi). Perigee: 152 km (94 mi). Inclination: 51.70 deg. Period: 87.60 min. This flight marked the culmination of the Apollo-Soyuz Test Project, a post-moon race 'goodwill' flight to test a common docking system for space rescue. 15 July 1975 began with the flawless launch of Soyuz 19. Apollo followed right on schedule. Despite a stowaway - a 'super Florida mosquito' - the crew accomplished a series of rendezvous manoeuvres over the next day resulting in rendezvous with Soyuz 19. At 11:10 on 17 July the two spacecraft docked. The crew members rotated between the two spacecraft and conducted various mainly ceremonial activities. Stafford spent 7 hours, 10 minutes aboard Soyuz, Brand 6:30, and Slayton 1:35. Leonov was on the American side for 5 hours, 43 minutes, while Kubasov spent 4:57 in the command and docking modules. After being docked for nearly 44 hours, Apollo and Soyuz parted for the first time and were station-keeping at a range of 50 meters. The Apollo crew placed its craft between Soyuz and the sun so that the diameter of the service module formed a disk which blocked out the sun. This artificial solar eclipse, as viewed from Soyuz, permitted photography of the solar corona. After this experiment Apollo moved towards Soyuz for the second docking. Three hours later Apollo and Soyuz undocked for the second and final time. The spacecraft moved to a 40 m station-keeping distance so that the ultraviolet absorption (UVA MA-059) experiment could be performed. This was an effort to more precisely determine the quantities of atomic oxygen and atomic nitrogen existing at such altitudes. Apollo, flying out of plane around Soyuz, projected monochromatic laser-like beams of light to retro-reflectors mounted on Soyuz. On the 150-meter phase of the experiment, light from a Soyuz port led to a misalignment of the spectrometer, but on the 500-meter pass excellent data were received; on the 1,000-meter pass satisfactory results were also obtained. With all the joint flight activities completed, the ships went on their separate ways. On 20 July the Apollo crew conducted earth observation, experiments in the multipurpose furnace (MA-010), extreme ultraviolet surveying (MA-083), crystal growth (MA-085), and helium glow (MA-088). On 21 July Soyuz 19 landed safely in Kazakhstan. Apollo continued in orbit on 22-23 July to conduct 23 independent experiments - including a doppler tracking experiment (MA-089) and geodynamics experiment (MA-128) designed to verify which of two techniques would be best suited for studying plate tectonics from earth orbit. After donning their space suits, the crew vented the command module tunnel and jettisoned the docking module. The docking module would continue on its way until it re-entered the earth's atmosphere and burned up in August 1975. 2018 May 26 - . Death of Alan LaVern Bean. - . Related Persons: Bean. American test pilot astronaut 1963-1981. Fourth person to walk on the moon. 2 spaceflights, 69.7 days in space. Flew to orbit on Apollo 12 (1969), Skylab 3..